A healthy baked chicken nugget. In a large bowl, combine 1 package ranch salad dressing mix, milk and Greek yogurt. Reserve ½ cup yogurt mixture for dipping. In a large bowl, combine remaining yogurt mixture and chicken. Marinate for 45 minutes. In a food processor, combine remaining ranch salad dressing mix package, corn flakes, salt, pepper and garlic powder. Remove chicken from marinade and dredge in corn flake mixture. Place chicken on a parchment-lined baking sheet and lightly coat chicken with cooking spray. Bake for 25 minutes or until internal temperature reaches 165°. 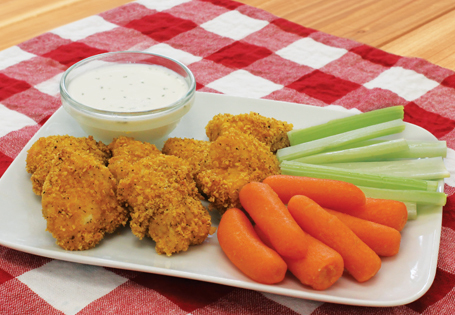 Serve with celery and carrots.